On Saturday night at the lodge the Internet went out, so no post since then. Then on Sunday after class we hid the road, with no time to hang out and post. Now it’s Monday morning, and we are at the Holiday Inn Express in Santa Curz getting ready to hit the road. My fiend and dojomate, Oya, is traveling outh with me. She is great company, and a very handy navigator. More later… For now, time to get showered and enjoy the breakfst and coffee downstairs. Midnight snack. 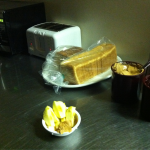 Or maybe “Still Life With Peanut Butter.” This camp is not a fancy resort, but it’s pretty new, and they are taking great care of us. Dinner was very good. I had an awesome salad and some rice, plus hard-boiled eggs I brought. The lodge is dark, except for this one corner with some snacks left out for us. It’s quarter to midnight, and there are two of us on the mat taking advantage of the WiFi. I’m having peanut butter on apples for a treat. I will probably be posting a little barrage of posts once or twice a day. We start early tomorrow – 7:00 – with bokken. Class tonight ended at 10:00, and I got showered right after, so all I have to do is roll out of bed, throw on my gi, and head down the hill to the lodge in the morning. This is inside the main lodge. 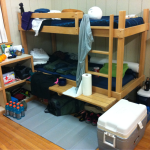 We have it set up with about 2/3 mat space, and 1/3 dining area. 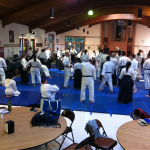 Today Nadeau Sensei taught most of the time, with Elaine Yoder Sensei teaching a bit before dinner. The drive here was two days of flat farmland, and rolling grassy hills dotted with oaks. Suddenly, just a few miles before the camp, there are trees. The camp itself is densely forested. This circle of Sequoias is along the path from our cabins down to the lodge. It’s a beautiful place! 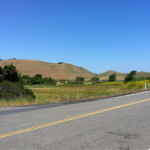 This was just off 580, on the way from Livermore to Napa, but it’s pretty typical of a lot of California. The wine country up here looks just like the Santa Ysabel and San Pasqual valleys in San Diego County. I took half a dozen wrong turns on the way here. I figure each one cost 20 minutes, to figure out where I was, which way I really would have been going, and how to get back on track. There are few places to turn out, and traffic is really fast on winding roads, so when you see an intersection or fork in the road that you didn’t expect, you just have to choose one, and then pull over 2 miles later to regroup. Oh well. Even with that, I got to camp right at 2:00. 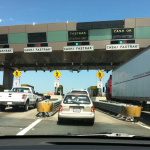 We don’t have many toll roads in San Diego, and none that I take regularly. For some reason toll roads freak me out. They don’t tell you very far ahead how much the toll is, and I never know whether there will be people who can make change, or if you have to toss coins into a basket thing. This one was $5, which I had handy, and it was staffed by really nice people. 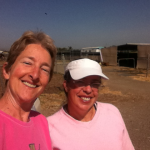 This is my friend Lisa, who I have known for ages, but this was the first time I had gotten to see her ranch. It’s a nice place, with lots of roomy pastures, beautiful little barn swallows glittering around, adorable dogs, and of course many lovely horses, including several new foals, and a few very friendly beasts who were very happy to get a good back scratching. Lisa is the friend who handled selling Rainy for me, the horse who inspired me to start training in Aikido. Lisa met me for breakfast, and we finalized the paperwork for his sale. I’m very grateful for all she did to find him an appropriate home. He is stalled at night, and turned out with buddies during the day, which he never had the opportunity to do when I had him, plus he get ridden on trails. Beats the heck out of standing around in my backyard. Last night I dreamed someone was trying to give me horse. He was a sweet little pinto, well behaved, but needed a little training. I turned him down, saying he sounded too much like Rainy, and besides, I’m not looking for a horse. So I guess that was my subconscious, agreeing with my choice to be horseless. We had a good visit, and it was nice to finally really close that chapter, to make room to move on. Camera batteries are charged, and SD cards cleared. Gis are washed and folded. Comfy road trip clothes, check – stretchy jeans, flip-flops, and pink Life Is Good tee Routes are mapped, and everything is in the car. I am running, predictably, 3 hours late. 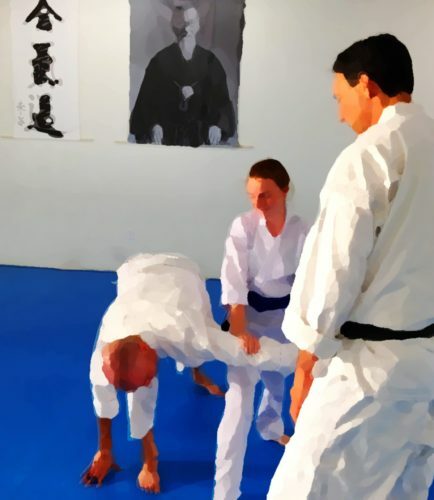 Still hoping to arrive in Livermore for the class with Saotome Sensei, which starts at 6:30. According to Google maps, I-15 to I-5 should take 8 hours and 1 minute, in current traffic. 488 miles. I’ve got 9 hours. So climb in, sit down, and fasten your seatbelt. Music for getting on the road: Safri Duo. Grab yourself a creme soda from that little blue cooler under your feet and run the window down. All set? Let’s go! I shouldn’t be sitting here writing. I should be doing my laundry, feeding the donkeys, and getting everything packed and ready to go. I’ll be leaving first thing Thursday, and it’s only Tuesday night, but I want to have a relaxed evening before I leave, and not be up late. So I’ll get as much done tonight as I can. It’s just after 10 p.m. I trained tonight, as usual, two classes. A lot of people are flying up, so I’m bringing some unwieldy things in the car – blankets, pillows, and toiletries bigger than the 3-ounces that airlines allow. I think I have 6 or 7 sets of weapons. I’ve lost count. I’ll get them all their safely, and then we’ll sort them out. Well that’s nice… I think I’ll go through Mojave. Probably not a lot better, but I’m familiar with the road, and it’s a nice enough drive. It’s been a very busy time at work. Fun stuff we’re working on, but it’s time for a break. One more day to wrap things up until next week. I’m really looking forward to this trip! Time to slow down, breathe, be outdoors… Time to be alone, and time to be with friends. I’d best start my laundry, get the camera batteries charging, pack stuff up, back up my iPhone and load it up with fresh playlists… Oh, and sleep.